For anyone living in the North the awareness that Summer is fleeting is ever present. We often try to cram as much activity into it as possible, for we know like the Starks of Winterfell that ‘Winter is coming’. My intentions to blog every Tuesday & Thursday were fine and good until Summer and all its glory hit me full force. I have been ini dated with pleasure….visits with friends I rarely get to see, beautiful drives and walks in fantastic nature spots, family, family & more family. I have also spent a good deal of time on my own spiritual practice. As a Druid, Nature is my temple….whether it is riverside or my back yard, the land itself is so intoxicating this time of year that I sometimes wonder where the time has gone. All the thoughts and insights I have intended to share with others has been absorbed into my very soul as I sit sometimes for hours just beingThe importance of Joy can not be overrated. We are living in a time when most people feel the pressure of busy & doing. These words have stepped up in our vocabulary to the pedestal of glory. Like good worker ants we often hear praise and acceptance from our peers when we answer “Busy!” to the common question of “How are you?”. I myself am certainly guilty of this one. When you have Squirrel on Crack as your dark totem, being busy is something that just happens…I don’t believe that I am in control of it at all times or that it is in control of me. Does busy breed busy? And how is this counter productive to a healthy life? Now Joy…Joy is something completely different. I think I am going to practice answering that common question of “How are you?” differently. Instead of saying busy, I am going to say joyful and see what happens. Does Joy breed Joy? I can honestly say that this summer that answer would be true. I am filled with Joy! Quantum Physics has proven that thought matters….so with that being true my theory of Busy breeding busy & joy breeding joy should be true. I welcome you to join me in this experiment. Try taking the love and sunshiny goodness summer offers and carry it with you as you continue through the year. After all we are just as busy in the summer as the rest of the year. We are busy visiting friends, enjoying nature and its glory & even working hard in our gardens. The difference in how we feel often comes from our attitude. Now I know you can argue a little sun goes along way. But here are the facts folks…if you live in the North, you live in the North….which means we have all different kinds of weather and most of us really do like this change of seasons. We may not like the length of winter, but we do love the beauty and glory that seasonal change offers. So choose Joy folks, loose yourself in Summer and then continue to loose yourself in the glory of Autumn & Winter & Spring….loose yourself in Joy. Yes you will still be going to work and you will still be driving your kids from here to there, but you just might find you enjoy it more. Me I am going to revel in JOY! For something to be seen as sacred it must move us, create a bit of awe inside of us helping us to step us out of our day to day lives. The sacred connects us on a soul level…it moves us, shakes up a bit…simultaneously making us feel both larger then life and small as a drop of water in the ocean. When coming in contact with the sacred we are momentarily more. We all search for this feeling of more, of being connected to the Sacred. Some of us know we are searching, others do it without even realizing what we are doing. I have been fortunate enough in my life to visit some pretty amazing sacred places…Stonehenge, the West Kennet Long Barrow, Oweynagat, Bridget’s Well in Kildare, the Anasazi Ruins of New Mexico and more. I am ever thankful for these moments and places and look forward to further travels in which I get to come in contact with ancient sacred wonders. But more importantly, I am thankful for the ability to recognize the sacred in my own backyard and the places close by and personal to me. I am thankful for the ability to connect deeply with the Divine (God/Goddess/Creator) through these places where the world slows down and we are reminded how fortunate we are to exist…here, now and in this moment. 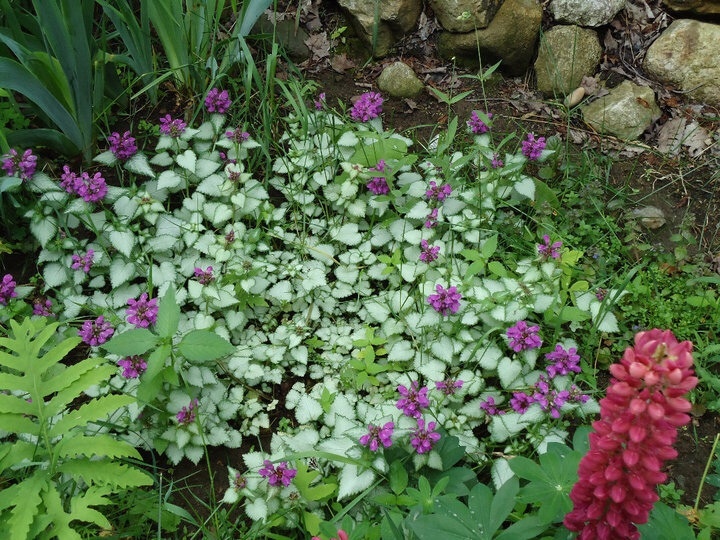 I have created sacred space in my own yard, a place of sanctuary where I can go any day, any time and connect. But I have also made it a point to explore the area close by and within a short travel so that I may come in contact with the beauty and sacredness of my own region. Last night I visited the Earth Clock @ Oakledge park in Burlington, VT. 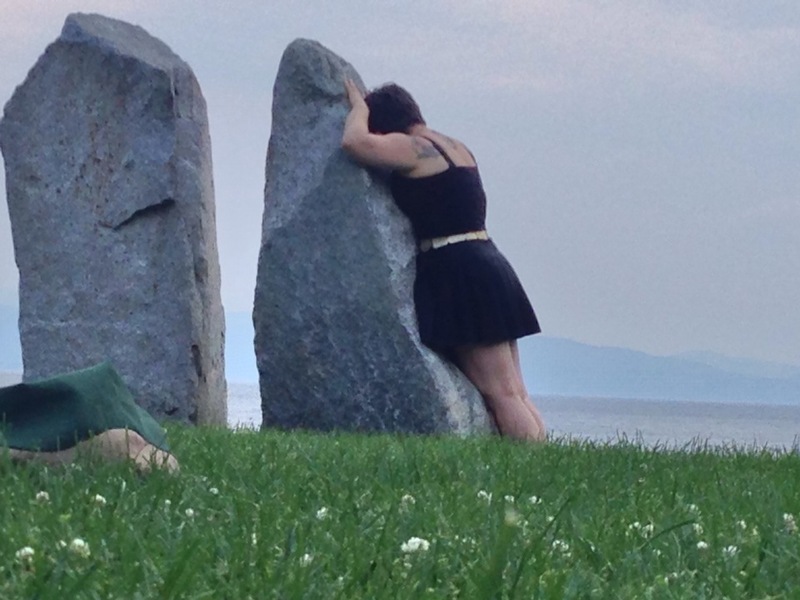 I know some of my Druid friends may be surprised to find out it was my first visit to the Earth Clock, but Burlington is a couple hours away from me and the ceremonies the Druids put on there always seem to coincide with other Solstice festivities I am already committed to. The Earth Clock was the manifestation of Patrick MacManeway & Ivan McBeth (my friend & Druid teacher from the Green Mountain Druid Order) & was created and maintained by many wonderful, earth loving people. The intent in creating the Earth Clock was to generate peace. I do not mean to give you all the detailed bits here, if your looking for that make sure to check out Circlesforpeace.org, the website has all sorts of good bits to fill your mind with knowledge. What I do want to share with you is the awe and connectedness I felt while sitting within it. As I said earlier, this was my first time visiting the Earth Clock. 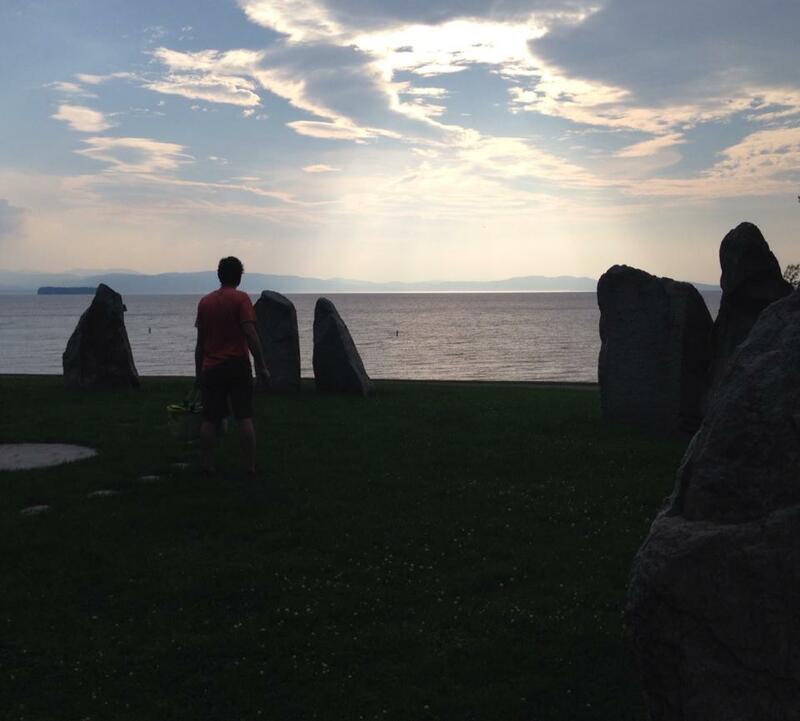 I have been in many other stone circles including some others in Vermont. The glory of this Stone Circle is that it is on public land and is open to everyone…. 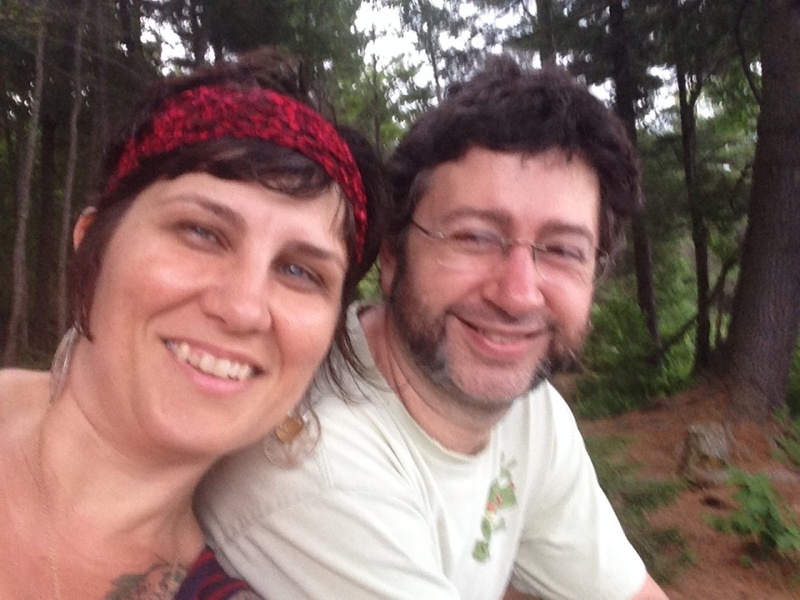 My husband and I were in Burlington last night to see a concert and decided to pack a picnic dinner and visit the Earth Clock first. Located on the waterfront in Oakledge park it was pretty easy to find, with a bike trail leading down to it. When we got to the circle I was not surprised to see other people already within it, what did surprise me was that the others were there to drum. Tuesday evenings at sunset there is a drum circle within the Earth Clock, an open invitation group of drummers connecting through the beat with the earth itself and sending their good juju out into the world from within a place of power. Stone circles are kind containers for the energy built within them, they are designed to be access points connecting us to Earth energy so that we can be fed and feed the Earth as well. The presence of peace was obvious the moment I stepped into the circle. I walked slowly around as the drummers kept their beat, connecting to each stone in turn. I allowed myself to absorb the energy they had to offer and gave back joy, thankfulness and heartfelt love. Love for the Earth itself, love for the people who created this glorious place and love for the those who sat within the circle with me. The view was breathtaking. With the sun just setting there was a luminescence to the water that was down right glorious. This beautiful, sacred space is so worth visiting. Plan on spending some time…sit and connect with the stones. Enjoy the synchronicities that line up, reconnecting you to your home…I cannot give enough thanks for the spirits that be and the drummers that drum, adding to my experience. How perfect that the first time I visit there is a circle of drummers within the stone circle, waiting to add to the ambiance of my experience. I know they do it every Tuesday…but I did not know it before last night. And I like to believe the Earth/Gaia loves me as much as I love her. She offers me little blessings and joys I cannot discredit as coincidence. I encourage you to go explore your backyard and the places near and far that hold spirit so deeply. Every yard, every town, every state, every country has a space within it that is sacred. Your job if you so take up the challenge is to explore the areas available to you and experience the sacred within them. Open your heart, remember the Earth/Gaia is alive. If you give her the opportunity to show you her glory, you will be stunned and amazed! Fire is powerful, entrancing and awe inspiring. It speaks to our primal soul, reminding us we are part of something greater…connecting us to that Tribal force we all hold deep with in ourselves. Years ago I was visiting a Druid camp in England and watched as the fire tender collected ash from the fire pit in a small jar. He went on to explain how it was their practice to collect ash from all sacred fires and sprinkle it onto the next fire they started. In this way they were carrying the energy of their gatherings from one fire to the next. This struck me as such a powerful practice that I have taken it up as my own. I do not collect ash from every fire I build, particularly if they are in the same fire pit. But when I attend a particularly powerful ceremony or family/tribe gathering I gather a few coals or ashes. What makes a Fire sacred? There are two fields of thought here, the first being all fire is sacred. I can relate to this and try to give respect to fire on a regular basis. As someone who heats my house with wood, I have a close and personal relationship with fire. Working with fire in this way, the regular…day to day fire building that sustains my home for a good portion of the year…I have come to notice how much better the fire starts and stays going when I truly pay attention to the action of building it. When I sit and nurture its beginning there is definitely a better response then when I haphazardly throw stuff together and walk off letting it do its own thing. As much as I consider my daily fires of fall-winter-spring important, I do not personally see them as Sacred Fire. I guess that means I follow the second train of thought which is that Sacred Fire is built with intention. Fire tending is an important job among many Earth based spiritual practices. The person or persons in charge of the fire may spend hours preparing the fire for large events and generally spends the entire ceremony holding the fire in their consciousness, tending to it like a lover. They are responsible for feeding the fire and managing it. When creating space for a Sacred Fire it is important to consider what you are putting into it. As a general rule (not to mention a good environmental one) you do not throw trash into a Sacred Fire. This includes paper plates, napkins and tea bags. You are not using your fire as a garbage disposal, but as a power source & focus for your work. Intention is key…what you place in a Sacred Fire should be meant to go there. This might mean a bit more planning is necessary, but not really. Some people may choose to be selective in the types of wood they use for their fire, or herbs they place on it. In some cultures it is common to give offerings to the Ancestor Spirits by placing them into the fire. Common offerings are honey, candles, flowers, herbs, cornmeal & tobacco. Me I am a practical gal. I hold intention when building Sacred Fires, but I have a tendency to use what wood is available, I even use recycled pallets in my fire. I do give offerings to the Fire, often of herbs and tobacco. Again intention is key here, I never carelessly throw things into my sacred fire. What goes in is meant to be there. When collecting Sacred Fire, I generally go for a few coals and some ash. After a ceremonial fire has died down or gone out, I will collect a couple of coals (do not collect hot coals unless you have the means to store them properly for carrying) and some ash. I like to collect the coals as I see them as being directly activated in starting a new fire. But ash is enough. If you are only collecting ash…sprinkle it over the wood of your new fire. Whether sharing the coals or ash from fire to fire, remember that intention is key. I like to sing to the fire when starting it as it helps me to connect to the energy I am sharing. Here is one of my favorite Fire chants. Sacred Fire does not always have to be Ceremonial in the deep, serious nature. To me Sacred Fire is created any time I am honoring my family or tribe. 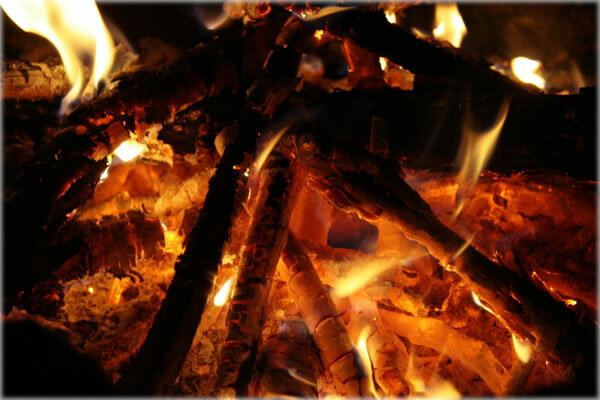 When a fire is lit at a family reunion, wedding, or celebration it is Sacred. That fire becomes the gathering spot of friends and family who often sit and reminisce. The stories they tell, the jokes they share and the songs they sing are part of the Tribal nature of human beings. We gather around fire to remember…we gather around fire to connect! I wish you all a fantastic summer with many opportunities to connect with Sacred Fire. Water is Sacred to many religions and cultures, with great store invested in the belief that Water holds the power to heal, cleanse and transform. My own relationship with water is a powerful one, and often my travels are based around visiting some water source…whether it be the Ocean, a Holy Well, Rivers, Lakes or Streams. There is something in Water that connects me directly to the source. 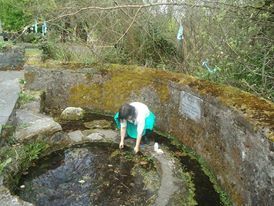 Over the last week, I have visited 2 of my favorite and most sacred watery places which just so happen to be in my backyard. Ok, not literally my backyard…but close enough that a day trip or couple hour jaunt is do-able. 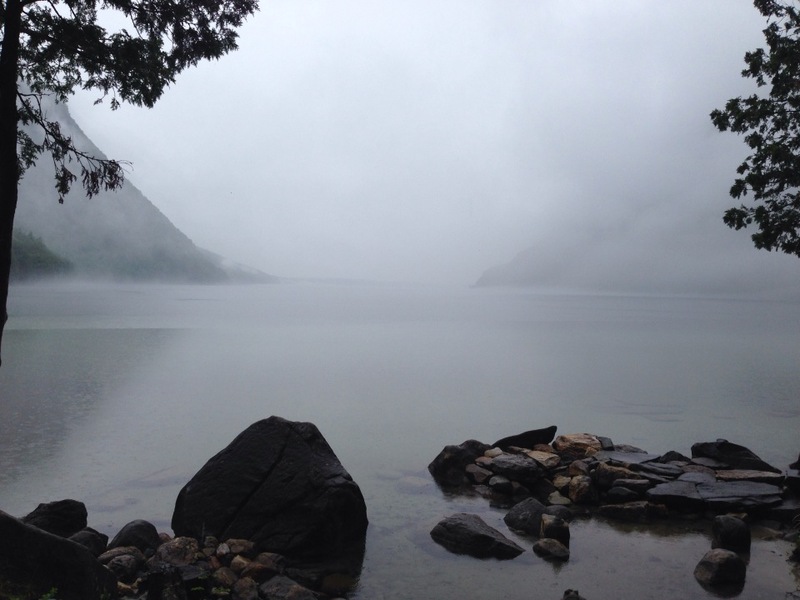 The first visit was to Lake Willoughby in Westmore, VT. I have talked about this fabulous lake before and I am sure that I will talk about it again. Willoughby is a Glacial Lake connected to the Crown Chakra, it was carved out when the last of the big glaciers moved through North America. It is so deep in the center that people have brought in mini submarines to explore its depths. The mountainous cliffs surrounding the lake make habitation limited. This helps secure the wild spaces, particularly on the west side of the lake & adds to the Magic. Last week I was particularly lucky & had the opportunity to visit when a soft rain and deep fog had settled on the lake. I wouldn’t normally think to go to the lake in such weather, but a dear friend was visiting and Willougby is one of the places we visit for magical outings. We trekked to the west side of the lake wearing our rain coats, carrying offerings for the Water Spirits and Fae folk who reside there. I was immediately overcome with awe at the beauty that greeted us…We sat on the rocks in the water with a gentle rain falling and mist like something out of a fairy tale surrounding us. We sang our Spirit Songs (primal singing infused with spirit) to the water, thanking it for its magnificence and just plain loving the energy that was surrounding us. The voices of others, the unseen folk surrounded us and it was hard not to keep turning around into the woods to spot our visitors. The peace and joy I came home with after my short visit filled me with bliss and a deep feeling of connection to the spirits that reside there. 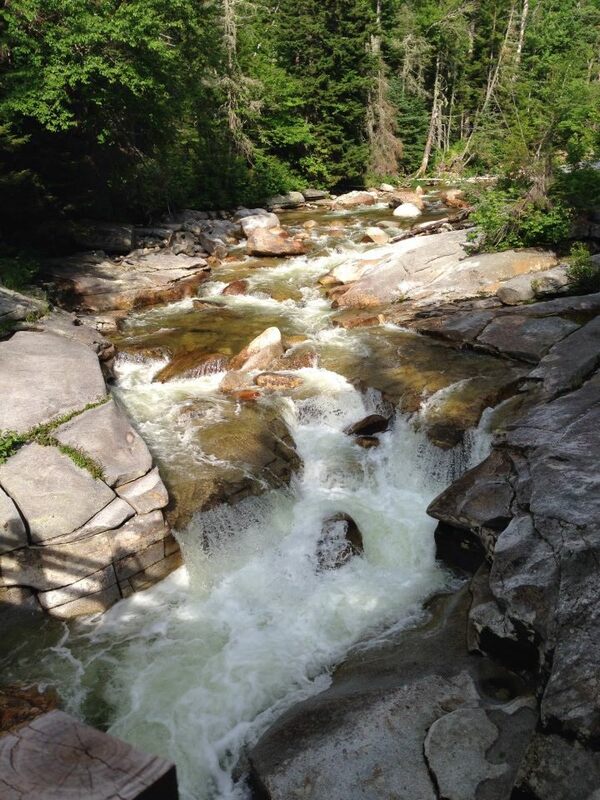 My second visit of the week was to the Middle & Upper Falls of the Ammonousac River in Bretton Woods, NH. This is a place that truly holds a bit of my soul, particularly in Shamanic terms as I almost drown there. As I child growing up in the White Mountains I spent a lot of time at the Middle Falls. It was a favorite of my parents, who preferred to swim in the icy, clear water of the River then in lakes or ponds. I was 12 years old and had been swimming against the current of the river for too long, lost control and was suddenly drowning….my Dad rescued me. I do not havefear of the river, just a healthy respect and understanding of the nature of water. Which is a good understanding to have. Many years have passed since I lived in NH, but I still go back to visit the falls every year. Now I go there to do work though as I know the energy of that river and the power it holds. 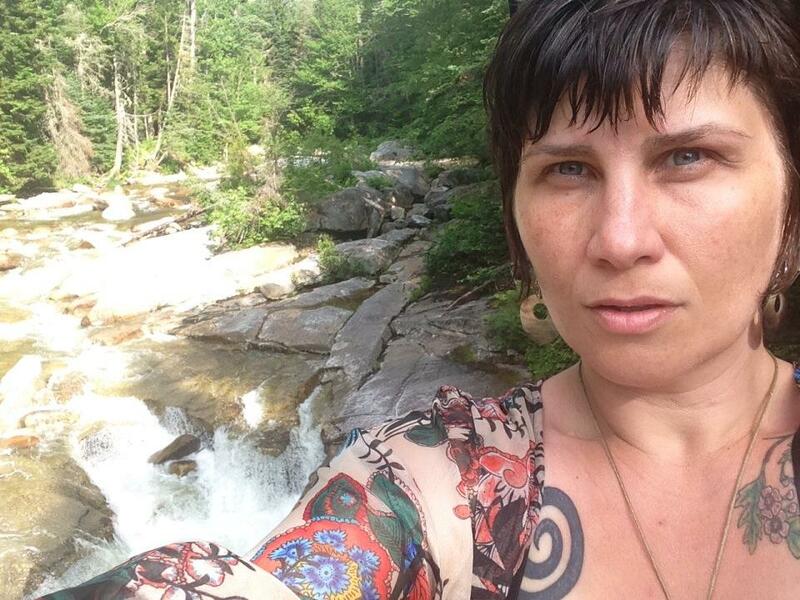 This year, like years in the pass I went to the river for deep manifestation work. I am at a major turning point in my life and choose to step boldly into my becoming. I choose the river for this work as it is fantastically cold! And that makes it a great catalyst for change…. After meditating on that which I am Becoming, I placed my offering on the ledge of rock and gathered my thoughts. I condensed them to a small nugget, a vibration of what I am seeking to become. When I felt ready I plunged into the icy, mountain water & released my thoughts. It was incredibly easy to release the thought, in fact it was almost impossible not to as the water is really quite chilly. this absolute surrender of thought is something I love. It is a complete moment of Divinity! That is the fantastic part about using the elements as a catalyst for your Spiritual work. They not only help charge the moment with their raw, untamed nature. But they also help us to feel it, know it for real and connect us to the source. For we know that the water is of nature and that the fire, earth and air are of nature & we are connected to them in that moment. I cannot recommend enough finding the Sacred in your backyard. Connecting with the inspiration of Nature and the world around you is not something set aside solely for world travel and exotic destinations. There are many amazing spaces in the area surrounding our homes. Open your eyes, see with the eyes of a Spiritual Adventurer and live your life out loud. Awen!